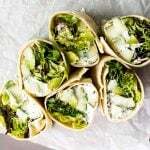 These fresh and crisp cucumber avocado wraps with fresh greens are sort of like those little cucumber sandwiches served at tea parties, but a lot less fussy and amped up thanks to a pesto-spiked cream cheese spread. 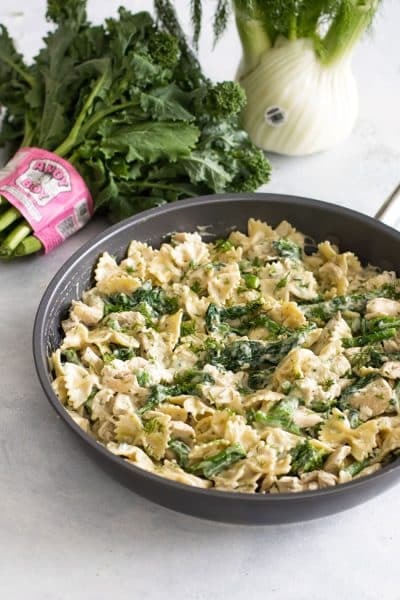 They’re an easy no-cook weekday lunch. I don’t consider myself the type who likes to sip tea and nibble on fussy little sandwiches with the crusts cut off, but classic cucumber sandwiches inspired these fresh and crisp cucumber avocado wraps. 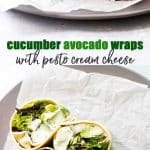 Consider them a cucumber sandwich on steroids amped up with a pesto-spiked cream cheese, creamy avocado, and fresh greens all wrapped up in a tortilla. 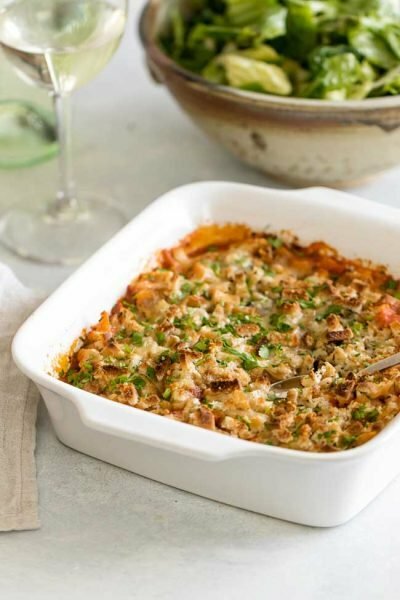 They’re great for lunch with a side of soup on the side and, because they’re a no-cook situation, they take all of fifteen minutes start to finish. I used whipped cream cheese because it’s spreadable straight from the fridge without having to wait for it to soften, which can take many hours. When I have homemade pesto on hand I use it, but a good quality store-bought pesto is a great short-cut. Look for the best options in the refrigerated section. I used regular 10-inch flour tortillas, but any sort of wrap will do especially if you want a bigger nutrition boost. Just make sure the wrap is at least 10-inches big for four big wraps. 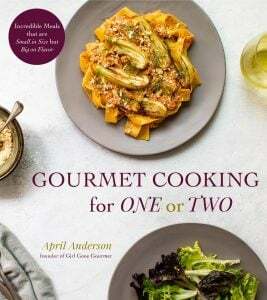 I used a spring greens mix, but romaine, green leaf lettuce, or bibb lettuce would work well too. These wraps go great with some soup on the side – check out my tomato soup or roasted red pepper tomato bisque. 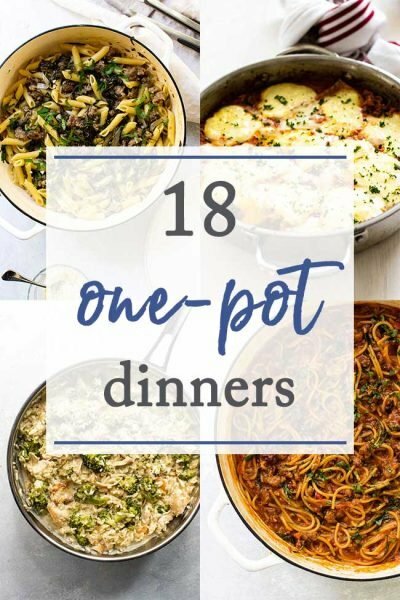 You can make the soup ahead for lunches all week! 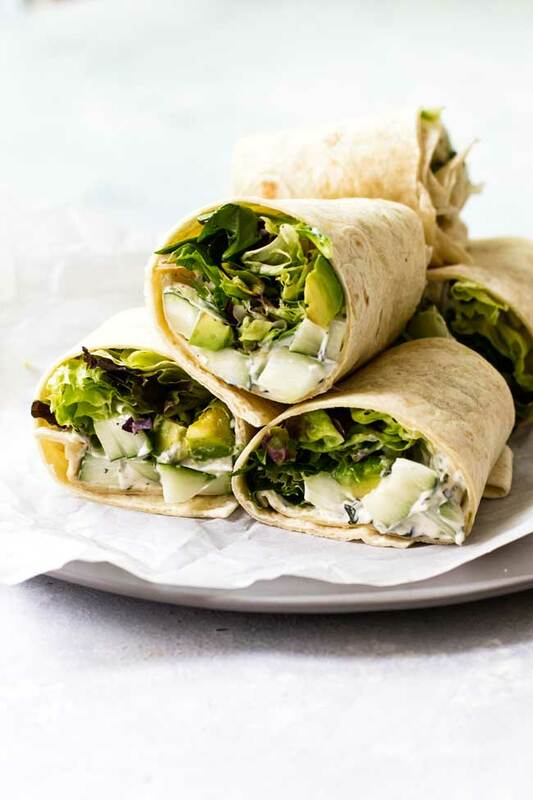 These fresh and crisp cucumber avocado wraps with fresh greens are sort of like those little cucumber sandwiches served at tea parties, but a lot less fussy and more amped up thanks to a pesto-spiked cream cheese spread. 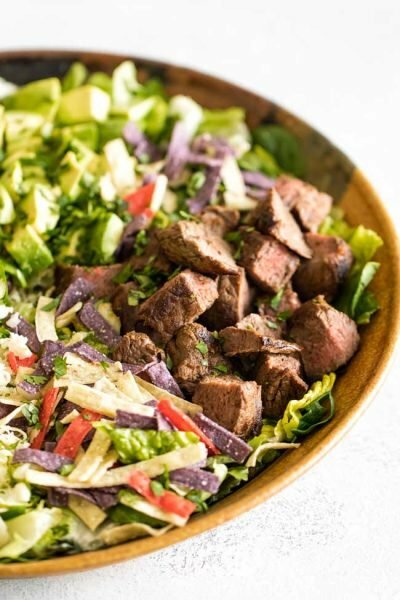 They’re an easy no-cook weekday lunch. Combine the cream cheese, pesto, and cucumber together in a medium-sized bowl. Place a small pile of greens on each tortilla. Top with some of the cream cheese mixture and the diced avocado. Sprinkle a couple pinches of salt over each tortilla before rolling them up. Updated from the archives. First published August 2009. After a weekend full of dance competitions and fast food, my family and I were ready for something light. 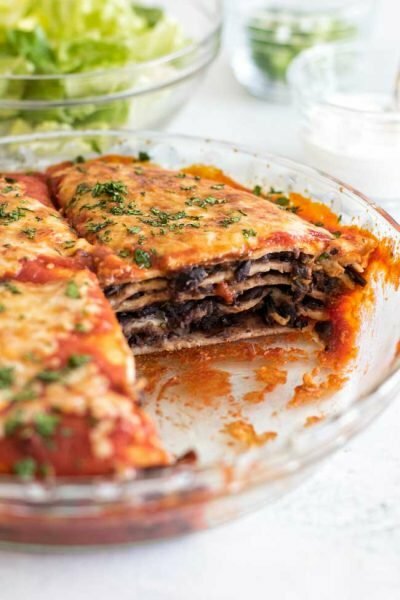 I made a vegan version of this and the entire family “mmmed” out loud the entire meal. Yum! What a fun, healthy lunch option! I love the update of classic cucumber sandwiches (which I love, by the way. They just seem so dainty and fancy to me!). This sounds like the most refreshing thing I could possibly have for lunch. I wish I had time to make sandwiches or wraps, but I’m just too busy for it. 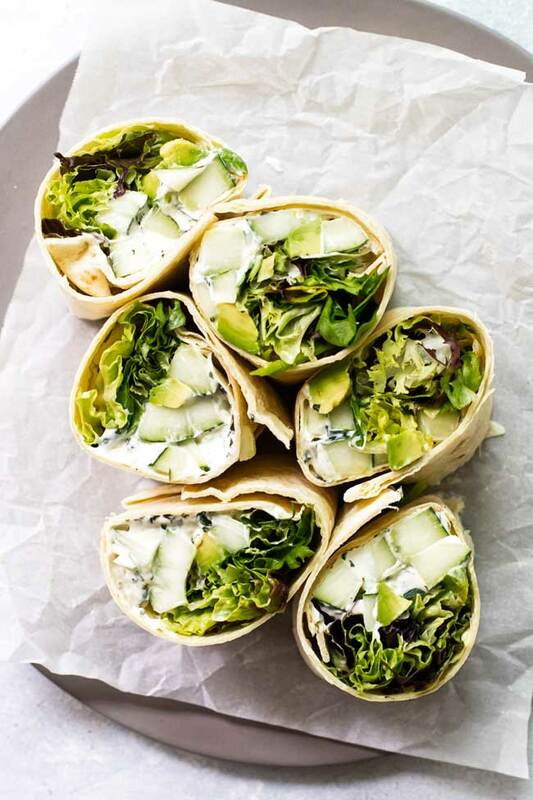 Maybe I can find a restaurant near work that makes good wraps like this.